It isn’t often that I find myself dumbstruck. I’m usually pretty quick with a comeback, and I definitely fall into the “talkative” category (just ask any of my teachers). But, since my pregnancy got dicey all those months ago, I have found myself speechless countless times thanks to the amazing support we got from so many people. You always hear that when times are tough, your real friends will be there for you. Well, not only were all our friends there for us, but friends of friends, parents, neighbors, coworkers, and cousins of friends of friends were there for us, too. It really was so amazing to us, and almost overwhelming. It’s hard for me to put into words how it feels that people I don’t even know care about us, and care about my daughter. I have received countless emails and cards, and I’ve saved all of them for Madeline to read when she gets older. Our friends that live close by have visited us during our different hospital stays, and those that couldn’t have emailed or called. My mom has been at the hospital every day, and we’ve had to force her to go hom to get rest. There have been offers to walk Rigby, to do our laundry, or do our grocery shopping. I don’t even like doing those things for myself!!! Matt & Leslie gave us gift certificates for dinner. Dozens of people have shared stories with me of their similar experiences that ended well. 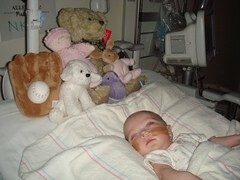 During this hospital stay alone, Maddie has received seven new stuffed animals, 13 balloons, and bunches of cards. Yesterday my friends Bella, Kim, and Leigh added to her collection with a Teddy Bear and clown balloons. Prayer chains in a handful of different religions are going strong in Maddie’s name. One of my favorite bloggers sent all her readers over to lend support. 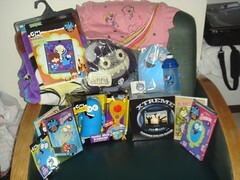 And then today, Maya send over a huge bounty of goodies. Like I said in my email to Maya, the presents are AMAZING, but the thing that really brightens our days is knowing so many people care. I’m sounding like a broken record here!!! Having a baby in the hospital is hard, but we are lifted up by the support of all of you. Thank you, a million times. Oxygen and Other Necessary Things.Oxygen and Other Necessary Things. of course! and if you need anything else, please let me know! maddie is a special kid. is she back in hospital? Yikes! As a mom of a Westwood NICU preemie I am thinking of Maddie and her mom and dad and wishing all three of you the best! My son was in the Westwood NICU in 2005 and as of today is a wild and crazy 2 year old who no one would ever guess used to weigh 3 lbs! !